A few weeks back I re-discovered a few mix tapes that Shira had made for me back when we were dating. While mix tapes were definitely a thing while we were growing up, I was never into music enough to think to create my own. I do, however, have a dim memory of the neighborhood kids sitting around with a tape record placed next to a radio. When the song came on that we wanted to add to our musical collection, someone would quickly hit the record button and we'd be good to go. It was Napster before there was Napster. In this dim memory, I recall hearing Fast Car, by Tracy Chapman being over-played on the radio (yeah, they did that back then, too). Wikipedia tells me this song was released in April of 1988, when I would have been 12 - so that sort of all checks out. Anyway, I had these now precious cassette tapes in front of me and I realized that our anniversary was fast approaching. I thought man, wouldn't it be brilliant to digitize these bad boys for the big day. My first thought was: how on earth can I ship them to a conversion company in the short period of time I have? Then I quickly remembered, uh, this is a cassette tape, I can probably pick one up at Goodwill for less than $10. And then I realized I was still overthinking this: I bet in my ancient hardware pile I probably have a cassette player. I even had the right audio cable to connect the output of the player into the microphone of the computer. In fact, the only thing I was missing to get this setup going were C batteries. So off to CVS I went to buy a 4 of them. I popped in the batteries and slid in one of the tapes. I hit the rewind button and the machine whirred to life. I then waited. And waited. Good lord, how long does it take to rewind a tape? With a loud click, the machine announced it was done. I hit play, and the tunes of over 19 years ago breathed to life. I then plugged in the tape player to the computer. I was on my Mac so it took a few minutes to learn how to record audio. The short answer being: launch QuickTime Player; go to File » New Audio Recording. I then hit record on the computer and play on the cassette player. And again, waited. When I was done, I had a 71 meg m4v file containing 30 minutes of music. I ran ffmpeg -i side_a.m4v side_a.mp3 and I was left with an mp3 file. The whole procedure couldn't have been simpler. I can't get over how tactically satisfying it is to use a real tape player. Everything feels so, well, real. 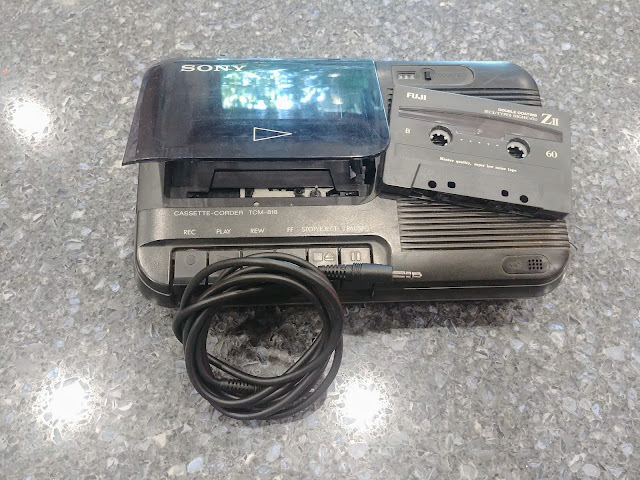 Given how easy it was to record this content, I'm going to have bust this old school tech out for my nieces and nephew and see what they think of it. Will they get a kick out of the limitations of life on cassette, or will they roll their eyes and ask to use YouTube? Today's our anniversary and we celebrated early by listening some of the recordings last night. Mission accomplished.